Ah summer. The florals, the colors, the prints! It is not only the spring/summer collection for adults, particularly for women that I’m interested in but as well as for kids. You really can’t blame me ha, if you’ve been malling frequently (who isn’t in this sweltering heat?) and pass by window displays of cute and adorable clothes for kids then you get me. SM Kids’ Spring/Summer Collection for 2013 was launched last April at the pool side of Dusit Thani Manila. Sadly, I wasn’t able to go but nonetheless here are some of the photos from the event. SM Kids’ Fashion tapped mom and image consultant Patty Betita to talk about summer fashion. Together with her team of junior stylists, the fashion model and former beauty queen will guide budding fashionistas on how to mix and match their summer staples. Check out the schedule of styling workshops that’s happening at different SM Malls. Summer style has always been one of the most vibrant looks in every kid’s wardrobe. With the Summer 2013 Collection, SM Kids’ Fashion lets boys and girls shine as bright as the sun. The apparel is a season-long celebration of fashion and fun as it puts emphasis on vibrant colors, eye-catching patterns, and chic cuts. The collection features five of the top summer trends for 2013: vivid neons, colorful leggings, playful swimwear, statement tees, and lively new patterns. Between lemon yellow tones and breezy floral dresses, each piece in the collection is a striking burst of style and color. Be it the mall or the beach, every summer destination becomes a fashionable runway for kids wearing SM Kids’ Fashion’s latest offerings. The Summer 2013 Collection is now available at all SM Stores nationwide. Cute party dress for your cute lil’ girls. Color blocking is here to stay no? Summer always calls for something floral. Loving this floral pants that’s not too bold and bright very much in time for spring. Lil’ Ms. GJG actually has this rash guard set for her swimming activities, she picked it herself. I even posted a photo of her wearing it on my Instagram. Swim trunks for your gwapito. Adorbs all the clothes no? Every time I’m at the department store, I get all giddy to shop for my kids. I just cannot help myself, all things cute are hard to resist not to mention the affordability. These clothes range from 399 php to 699 php only! This contest is open to all kids up to 12 years old. If you don’t have a child but interested to join, your nephew or niece can join as long as there’s consent from the parents. Send as many photos as you like. 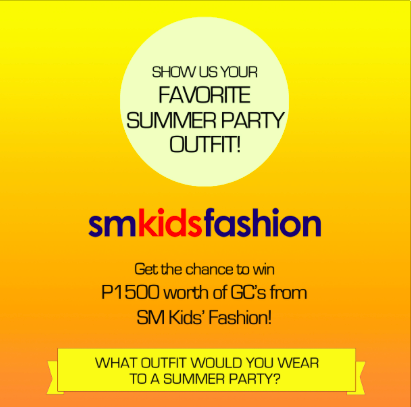 The chosen photo will win 1,500 php worth of GCs from SM Kids’ Fashion. Contest will run today until May 10,2013. I’ll announce and post the winning photo on my Facebook page on May 13, 2013 and a representative from SM will directly email you as to how you can claim your prize. Happy Labor Day to all hardworking moms, dads and individuals! May you achieve satisfaction and success in whatever work you’ve chosen. Is it international?I’m from Russia.